This version merges the BWIPP on the SAP server side. Therefore there is no need to configure PDF software or use scripts to introduce the BWIPP to generate barcodes. By using standard SAP configuration the BWIPP can be merged into the SAP output stream on the server side. Therefore reducing any configuration on the client side. 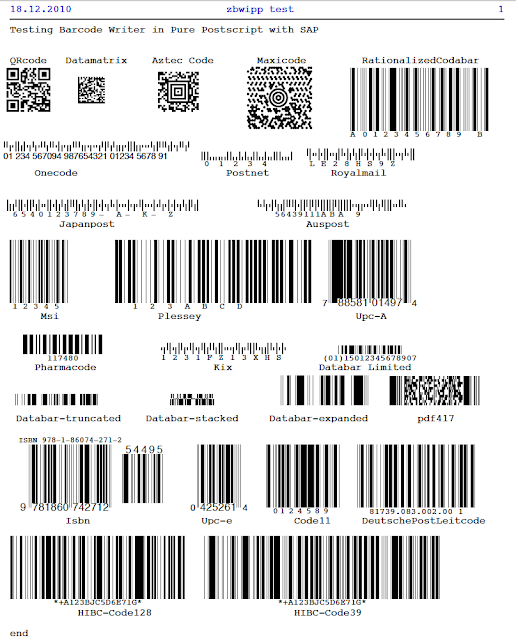 Also as the solution is purely postscript based ANY postscript 2 compatible printer can be used for a barcode solution. See my earlier post in regards to printing postscript on HP printers. Note: Please pay attention to the number of "+" after the letter "D". 5) Follow this original post in regards to a standalone QRcode solution but CHANGE the following steps. Here is a video covering barcodes in SAP Smart Forms with the BWIPP. This version relied on merging the the Barcode Writer in Pure Postscript (BWIPP) being with the SAP output on the desktop by using scripts. This version relied on merging the the Barcode Writer in Pure Postscript (BWIPP) with the SAP output on the desktop by using PDF software configuration. Not sure what the exact problem is, can you provide an error message. The SAP parameter should pick up the Dbwipp if it is in the right directory. I'm interesting in your demo tutorial. I want to try it, but the download link isn't work. Would you please to give me the work link. Thank you for the interest in my blog and taking time to comment. Apologies for the missing download as Dropbox have switched off public downloads now.